What Happens If I Have No Records Of My R&D For A Claim? Home » What happens if I have no records of my R&D? What happens if I have no records of my R&D? Record-keeping is an important part of a research and development (R&D) tax credit claim. HMRC expect to see some form of records. Good records often serve to maximise a claim’s value. If you have no specific records for your R&D tax credit claim, all is not lost. ForrestBrown will work with you to discuss the work undertaken and create a bespoke claim methodology. If you have no specific records of your R&D, you are not alone and all is not lost. You may still be able to claim R&D tax credits. Often, companies do not realise at the time that what they are doing counts as R&D for tax purposes. However, these projects will usually have left their mark within your business, even if you did not formally keep records. In most cases records can be pieced together to form the basis of your R&D tax credit claim. What R&D activity are you trying to capture? To claim R&D tax credits, you need to identify your qualifying R&D activities, and your qualifying costs. These are defined in the guidelines set out by the Department for Business, Innovation and Skills (BIS). The key cost categories are staff, externally provided workers (EPWs), subcontracted R&D and consumables. The legislation requires you to attribute these costs to your qualifying R&D. The phrases ‘appropriate proportion’ and ‘just and reasonable apportionment’ both appear within the R&D tax legislation. This wording means you need to consider how you will attribute costs to R&D activities. HMRC’s Corporate Intangibles Research and Development (CIRD) manual provides guidance on their approach to reviewing R&D claims. It includes no specific requirement to maintain records for R&D purposes. However, we have seen a shift in HMRC’s approach towards an expectation for more formal record-keeping processes. More and more, HMRC expect to see contemporaneous, documentary evidence kept to support claims. Record-keeping for R&D purposes is not an unreasonable requirement from HMRC given that R&D tax credits are paid from the public purse. In practice some flexibility is afforded to companies making their first claim(s). 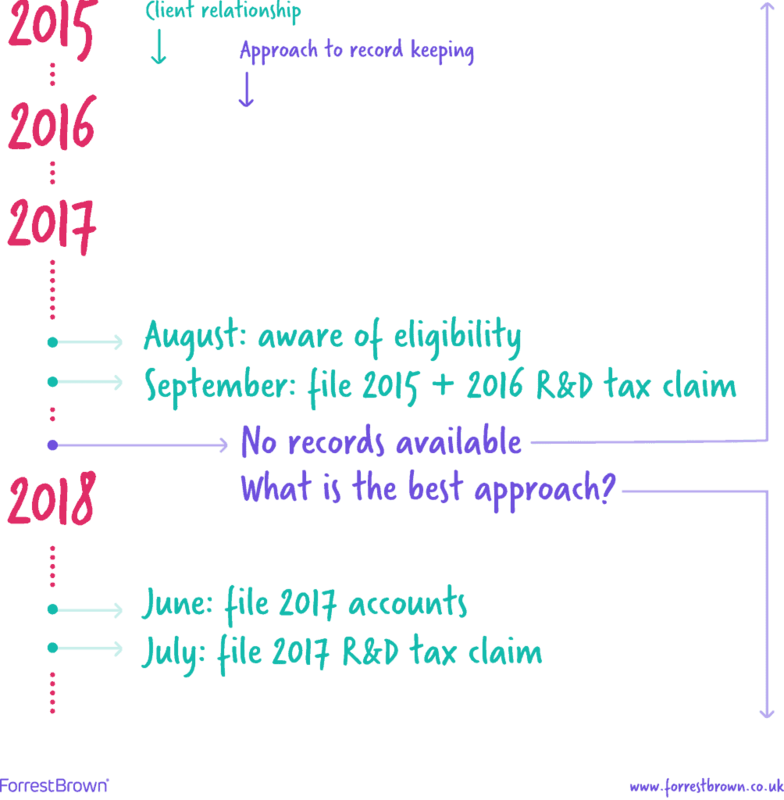 The difficulty in preparing a claim without records is the time-lapse. Since you are able to claim for your two preceding accounting periods, you may be considering activities that took place up to three years ago. The danger is that you may not fully maximise the value of your claim. We strongly recommend real-time record-keeping for R&D processes. It strengthens your claim from HMRC’s perspective, makes the process of claiming considerably easier for you, and often increases the value of your claim, in comparison to claims where estimates were relied on. The method and level of record-keeping should depend on your business and its needs. A timesheet system is the preferred approach from HMRC, however this is often not a practicable or commercial option for companies. An alternative solution may be a quarterly review of projects undertaken with notes kept about the nature of the work. Another solution could be reviewing staff involvement in R&D at senior management meetings. Here at ForrestBrown, we’re always happy to advise on how to improve your record-keeping to increase the robustness of your claim. The record-keeping support and advice we offer at ForrestBrown is included as part of our service – it’s part of an ongoing relationship we enjoy building with every client. We recognized the value in ForrestBrown educating our management on the tax definition of R&D, and best-practice record-keeping to support our claims. As well as broadening the scope of our claims, it helps us manage the risk of an HMRC enquiry with better-quality submissions. The results speak for themselves, and we expect to benefit for years to come. How do I allocate my employee's time for R&D claims? What records do I need to keep for an R&D tax credit claim?